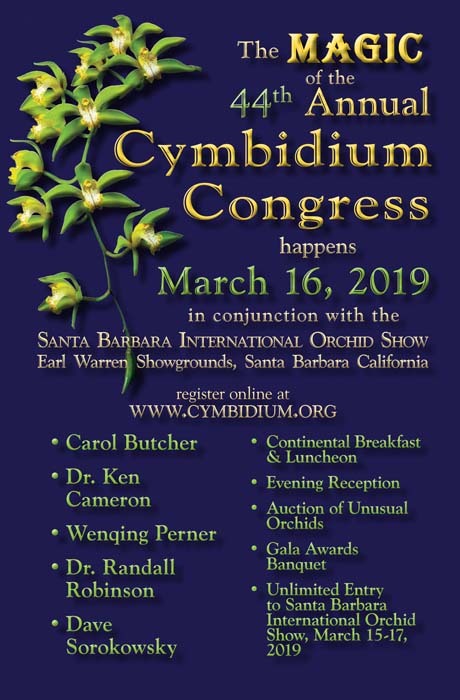 The system of award judging approved by the Cymbidium Society of America, Inc. is based on theoretical perfection. Each Judge’s personal appraisal of the characteristics listed on the judging form is allotted points according to a percentage rating based on his concept of theoretical perfection. The result should be carried out to two decimal places. The basic standard of judging is the individual Judge’s concept of a perfect flower under rules and standards of the Society. The foundation for this standard is the Judge’s experience in judging and evaluating quality flowers each season so that his concept of perfection will keep pace with the development of the genera involved. In judging multiflowered genera, the flower with the best general appearance and maturity should be selected for measurement of size and determination of shape, color, substance and texture, provided that the other flowers are of a relatively even and comparable standard. The spike or stem with the selected flower must also be utilized for judging. This is, also, the flower to be photographed. FORM: Definition of what constitutes good form should be fairly broad but not lax, and is detailed in the criteria .for each category. Forms and their variations may have their horizontal and vertical shaped flowers, but in all types balance and symmetry are desirab.le. Variations in form may be acceptable so long as the definition of good form is observed, and there is distinction with the overall appearance in accordance with the Society’s concept of award quality. Recognition should be given to the best examples of all flower forms if award qualities are otherwise present. COLOR: Color is appraised in the same manner as form and both are given an equal number of points. 1 Flower color may be white or any other color or combination of colors. Each color should be appraised on the basis of how good or bad it is for its class against the judge’s concept of perfection for each genus. Care must be used to avoid a judge’s color preferences or prejudices influencing his color appraisal. Each color must be judged for what it is; markings; stripes and shadings should be well defined and distributed so as to enhance the color appearance of the flower. Muddy, smudgy, and improperly distributed color should be avoided; however, polychromes and mottled colors need not be automatically discarded. Sepal staining, or bronze pigmentation on the back of the sepals due to excessive light during the bud state, should be considered on the basis of whether it gives the flower a muddy and undesirable appearance. Exhibitors must be advised to use proper cultural methods to avoid sepal staining. Bright, fresh, glistening colors are highly desirable and are due recognition. Lip color should be considered in evaluation of the general color and appearance of the flower whether it is contrasting, or consistent with the general color. Measurement: Measurements shall be in centimeters. Size of flowers in all genera shall be measured across the visual limits of the petals without change or correction. Substance and Texture: Substance refers to the thickness of the sepals and petals; texture refers to the surface appearance of the sepals and petals. Sufficient substance must be present in an award quality flower. Good texture will provide a lustrous sheen that emphasizes the colors of the flower. Spike Habit and Flower Arrangement: The spike should be sufficiently strong to support the infiorescence with a minimum of artificial support. It should be tall enough to carry the fiowers above the foliage; it should not be twisted or crooked or require several support ties. The spike may be upright or arched, but flowers are best displayed when they are evenly distributed without crowding or overlapping on the spike. Floriferousness: All, or nearly all, of the flowers on the spike should be open to insure maturity of both the form and color. Cymbidium spikes with fewer than 75% of the flowers open should be disqualified and the exhibitor asked to resubmit the plant when the flower spike is mature. This category is established to encourage the propagation of cymbidium species and to award outstanding examples of individual species. General form should be an improvement over the normal shape of the particular species being judged, with segments being fuller or wider than the average form of the species. A minimum of 75% (22.5 points) is required for an award. Clear color is desirable; combinations of colors and suffusion of one color over another should be harmonious and pleasing. Both the normal color and albino forms will be judged. A minimum of 75% (22.5 points) is required for an award. Generally three basic types of form are recognized: the classic round shape, the oval, and the open star-like shape. In all types, balance and symmetry are desirable. The petals and sepals should be broad and may be either pointed or rounded distally. The dorsal sepal should be erect; excessive hooding or reflexing is undesirable. The ventral sepals should be broad and arranged so as to fill in the spaces between the petals and the labellum. Reflexing or turning in of the ventral sepals is to be avoided. The lip should be proportionately sized, wide and full in form without turning under. Hooding, furling, reflexing and other distortions of the lip are undesirable. Variations of the three basic types may be acceptable so long as the definition of good form stated above is observed and the overall appearance is in accord with the Society’s concept of award quality. All desirable types of form should receive fair consideration, and recognition should be given to the best examples. The color of the flower should be definite and attractive. It may be white or any other color or combination of colors. Each color should be appraised on the basis of how good or bad it is for its class against the Judge’s concept of perfection. Markings, stripes, veins and shading should be definite, distinctive and evenly distributed so as to enhance the color appearance of the flower. Muddy, smudgy, and/or poorly distributed color should be avoided. Sepal staining should be considered on the basis of whether it gives the flower a muddy and unattractive appearance. Bright, fresh, glistening colors are highly desirable and should be given the recognition they deserve. The lip should complement the petal and sepal color by the use of contrasting colors in the form markings, dots, bars, etc. Lip color should be distinctive and add to the overall beauty of the flower. Each judge will distribute a maximum of seven points in each category. Large individual flower size and high flower count are desirable characteristics for the category of Standard Cymbidiums. Unless other aspects of the flower are outstanding it is unlikely that a spike bearing less than nine flowers will receive an award. A desirable spike habit for standard cymbidiums is one where the spike is tall enough to display its flowers without interfering with the foliage of the plant. It may be gracefully arching or upright. It should be free of kinks or unsightly twisting. The flowers on the inflorescence should be arranged so that they are all well displayed without crowding or bunching. The substance for an award quality flower should be greater than the average. Texture should be recognized as a distinctive sheen to the flower surface that intensifies its color. Cut spikes from outside the national border of the CSA Judging Center may be judged. This classification was established to encourage the development of miniature type cymbidiums, which are not necessarily miniature in growth or flower characteristics, and would not ordinarily qualify under the miniature cymbidium classification. To be acceptable in this classification a known dwarf flowered species must be in the background of the plant. Flowers must score at least 75% in both form and color. The entire plant is judged; cut flowers will not be accepted. The silhouette of the flower, in general, may be round, square, or triangular: some star-shaped, or vertical oval types of form are also acceptable. Symmetry and balance of the flower are characteristics underlying pleasing proportion within the flower. 15 points required for an award. All colors are considered. They must be clear and distinct. Stripes, shadings, overlay or color, and color contrast between the lip and other segments must be attractive and enhance the color charm of the flowers. Bright, fresh colors are highly desirable and must be recognized by the judges when making their color appraisal. 15 points required for an award. In this classification the number of spikes should be in proportion the size of the plant. Plants exhibiting 12 or more flowers per spike are desirable. The substance for an award quality flower should be greater than the average. Texture should be recognized as a distinctive sheen on the flower surface that intensifies its color. Straight and arching, the flower spike should be long enough to stand above the foliage. Spikes may be straight, arching, or pendulous. Flowers should be arranged so they are well displayed without crowding and bunching. The foliage should be clean and in good condition. All unsightly dried tissue should be removed. In this classification, plants may not have the classic proportions normally considered essential in award cymbidiums. But charm and distinction may overcome these shortcomings and product a very attractive specimens. A certain color, or combination of colors, may be distinctive characteristics, as well as form or a particularly fine spike habit. Judges must be aware of these qualities when appraising their point score. These points are given at the Judges’ discretion. In order to qualify for this category a plant must have a known dwarf species in its primary or secondary parentage. The plant and its flowers must also have the dwarf or miniature characteristics. A complete potted plant is judged; cut spikes are not acceptable. Balance is the most desirable characteristic in the general form of miniature cymbidiums. Petals and sepals should have enough width to them to give the appearance of roundness. They can be held on a flat plane or be slightly concave. The lip should be full and wide and lend balance to the flower. 15.0 points (75%) required for an award. The color of the flower may be white or any other color or combination of colors. The overall color must be definite, clear and distinctive. Stripes, shadings, and overlays of color, etc. must be attractive and enhance the color charm of the flower. Muddiness and poorly distributed color patterns are to be avoided. Bright fresh glistening colors are highly desirable and should be recognized by the Judges when making their color appraisal. The lip color should complement the overall color of the flower by the use of contrasting or matching colors in the form or dots, bars, etc. Lip color should be distinctive and add to the beauty and charm of the flower. 15.0 points (75%) required for an award. The Judge’s appraisal of these characteristics must be made on the basis of his experience in judging a potted plant. A plant with several spikes which are distributed evenly around the foliage each holding twelve to sixteen or more flowers is the desirable concept of a high quality miniature Cymbidium plant. Immature plants, with one spike and a few flowers, are to be avoided. The substance for an award quality miniature cymbidium flower should be greater than the average. Texture should be recognized as a distinctive sheen on the flower surface that intensifies its color. are all well displayed without crowding or bunching (approximately 50% of total). The appearance of the foliage is important when appraising the quality of a miniature cymbidium plant. Proper culture and grooming are essential in providing attractive foliage. Leaves with burned tips and other dead tissue, along with dried flower sheaths, should be removed. Yellow, spotted and diseased foliage should also be removed. Only plants with healthy attractive foliage should be considered. Charm and distinction may be the projection to the observer of one or more characteristics of the plant that commands attention above the usual qualities present. This is most commonly found in rare colors, unusual colors, or combinations of colors. Attractive color patterns in the lip may also contribute to the charm and distinction of a flower. Sometimes the form and carriage of the flower will give a distinctive and charming appearance. These qualities should be present in high quality orchids and Judges must recognize these admired characteristics. Standard Paphiopedilums will be judged under our point scoring systems, for all green leafed typed, as follows. The general form of the flower should be full and round or oval; either a vertical or horizontal oval is acceptable. The dorsal sepal should be large, full and round, slightly concave and not reflexed. The ventral sepal should form a background for the pouch and extend low enough to give a balance appearance. The top of the ventral sepal should overlay the bottom of the dorsal sepal giving it support and preventing reflexing. The petals should be broad and rounded on the ends, and held on a horizontal plane. They can be slightly concave to blend in with the other segments of the flower. They must not twist, droop, or reflex in any manner. The pouch should be in proportion to the rest of the flower, and held in such a way as to give balance and beauty to the flower. Symmetry and balance are essential to award quality form in Paphiopedilums. 30.0 points (75%) required for an award. Colors include white or any other color or combination of colors. They should be clear and definite with patterns and markings well-defined. Muddy or blurred colors are to be avoided. The size should be large for the group in which the flower is classified. The substance should be heavy and the texture of patent leather quality in the pouch and petals. Flowers with a papery appearance and/or transparent edges on the dorsal sepals are undesirable. The stem should be strong, tall, and straight in proportion to the size of the flower. The stem will be measured from leaf axis to the top of the ovary, or from the bottom of the ovary to the base of the plant. A novelty Paphiopedilum is a species or hybrid that because of its form would be ruled out under the standard judging procedure. Hybrids with parentage that would place them in the standard classification shall not be judged as novelty Paphiopedilums. The flower should be well-proportioned and symmetrical, with the pouch in proportion. It does not need 75% for form to qualify for an award. All colors are considered. They should be clear, fresh and glistening, without muddiness. Markings should be evenly balanced in like sections of the flower. 22.5 points (75%) required for an award. Novelty Paphiopedilums may have several flowers and buds on a single stem, although all need not be open at the same time. The substance should be heavy and the texture of good quality in the pouch and petals. The stem should be straight and hold flowers above the foliage. The foliage may be of solid color, mottled or tessellated. It may be erect or arching. It should be free from blemishes. These qualities may be found in rare and distinctive color patterns, form and carriage of flower and unusual foliage markings. and phragmipediums are judged under novelty paphiopedilums.